Donkey Kong Jr. Math is a Nintendo edutainment video game where the player must solve math problems in order to win. It was released in 1983 for the Family Computer and then outside Japan for the Nintendo Entertainment System two years later. In Japan it was released nearly one month after its first counterpart Popeye no Eigo Asobi which involved Popeye and English spelling. Donkey Kong Jr. 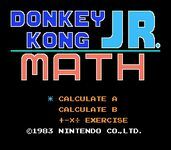 Math was re-released in Japan in a two-in-one cartridge with the original Donkey Kong Jr. Source: Wikipedia, Donkey Kong Jr. Math , available under the CC-BY-SA License.